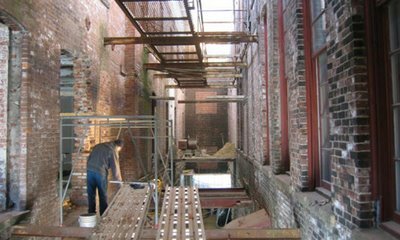 Yesterday, I toured Building 7 at Mass MoCA, which is being renovated to host 93 Sol LeWitt wall drawings. Workers are busy putting up sheetrock walls in the old 27,000-square-foot, three-story brick factory building, which is currently not part of the North Adams museum’s exhibition spaces. The numbers make it clear that this is a big project. For comparison, the 1999 LeWitt retrospective featured more than 200 works in all media. But perhaps the largest current installation of LeWitt’s wall drawings is the 14 on view at Dia:Beacon through September 2008. Seeing row upon row of empty gallery bays at Mass MoCA, what’s clear is that this will be the monument to LeWitt’s wall drawings. It could make Mass MoCA one of those art pilgrimage meccas – maybe a bit like Donald Judd’s installations at Marfa, Texas. The LeWitt project, covering his work from 1968 until his death this year, is a collaboration between the Yale University Art Gallery and Mass MoCA. Drawing is expected to commence in April or May. And the whole thing is slated to open in November 2008 – and then remain up for at least 25 years. For more details see this Mass MoCA press release.